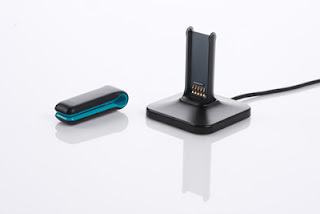 I remember hearing about the fitbit back in September 2008 - a tiny little device that monitors your activity - and your sleep, too! And it was only $99! I didn't pre-order it though - I thought it was too good to be true. But a couple of my friends jumped on the pre-order. ;) They started receiving their units in September 2009 (yes, a year later...) and the overall vibe was positive. So I went ahead and ordered. It arrived three months later. It's a cute idea, but it completely failed for me. Y'all might remember that I walk a lot. ;) I have used several pedometers, and I have full confidence in my current pedometer - I've counted thousands of steps with it and it's always spot-on. The fitbit was off, every single day, by 30-60%. That's completely and utterly unacceptable. It counted hundreds of steps while I was driving - and I'd even wake up with steps counted! Are you serious? I'm supposed to trust this device? So I declare shenanigans on that! The rest of the nights were similarly off as well. It was ridiculous. :( I have big problems falling asleep, and I was immensely curious about my sleep patterns - but this device didn't help clear up anything for me since I know it was inaccurate about my falling asleep data. I posted on their user forums, but never received any reply (even though a "staff" person was replying to other posts in the same thread after mine). So with a heavy heart, I returned it. They did pay for the return shipping, but it took a long time to get the refund (had to send them a nagging email and then it finally got refunded). I think this is an interesting idea, but unfortunately the implementation is awful. It's a cute little device - and I'm glad it's getting people moving more - but the data is totally unreliable. 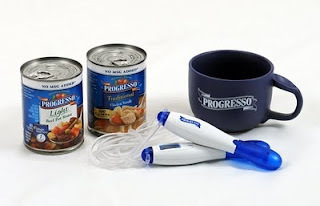 The cool thing about this is that Progresso and MyBlogSpark gave me a package to give away to one of my readers! The gift pack contains a huge soup mug, a digital jump rope and two cans of Progresso Soup. Just comment on this post with your favorite flavor of soup and you'll be entered to win! A winner will be chosen via Random.org and announced here on February 7. The lucky winner will have three days to respond with mailing information before another winner will be chosen. No end-of-the-year recap from me right now - I lost about 15 pounds over the year, so that's not bad. Not as much as I would've hoped, but at least it's a loss. ;) I am still recovering from my surgery - and then we moved so I'm swamped in boxes and trying to get settled in. Exercise has fallen to the side - and I haven't been for a walk in weeks. Hopefully things will calm down in a week or two. Hope 2010 is a happy and healthy year for us all!